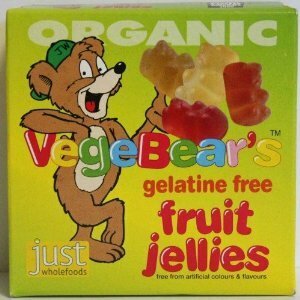 I've rounded up the best vegan gummies on the market today so you can enjoy a nostalglic snack that's actually cruelty-free. 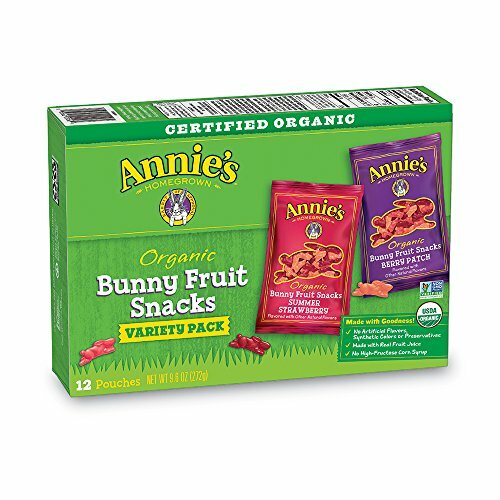 The Bunny Fruit Snacks from Annie's come in delicious bursts of berry-flavored goodness. They are flavorful, brightly-colored, and satisfyingly gummy without being sticky. You can feel good about the all-natural flavors and coloring, too! This company got its start when the founder (Annie) was selling mac and cheese made with wholesome ingredients from the trunk of her car. It's come a long way since this, and this health- and ethics-conscious brand is found just about everywhere, including most mainstream grocery stores. Their product line has expanded far beyond mac and cheese (which now includes a vegan version) to also offer yogurt, snacks, condiments, frozen foods, and soups. Their certified organic bunny-shaped fruit snacks are one of their popular snack foods. 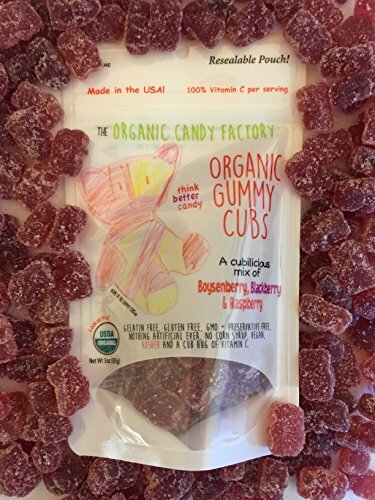 These Gummy Cubs come in different berry-licious fruit flavors and are delightfully textured with a great mix of sugar-coated exterior and a gummy center. Every kid dreams of opening a candy factory, but Ginger made her dreams a reality (with a little help from her mom, who insisted that all of her ingredients be organic and of the highest quality). The candies launched in Los Angeles and are all made in the USA. They carry gummy cubs and chocolate bars. 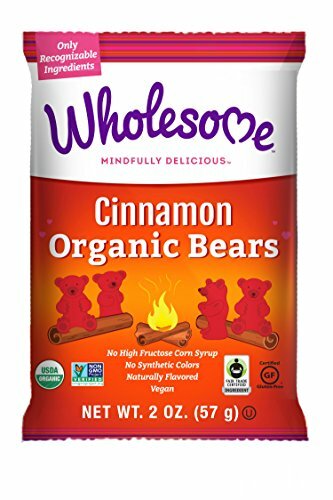 These Cinnamon Organic Bears offer all of the nostalgic joy of a childhood treat with the slightly more sophisticated flavor of spicy cinnamon. If you're looking for a red-hot treat you can feel good about snacking on, this is a great choice! Wholesome launched in 2001 with a simple mission of making the world a little sweeter and a little healthier at the same time. They focus on creating high-quality sweeteners out of wholesome ingredients, and their product line includes everything from cane sugar, to frosting, to syrup, to candy. These gummy bears come with all sorts of different flavors: orange, strawberry, pineapple, lemon and more. They're also free of gluten, dairy and any artificial colors and flavors. What more can you ask for in a gummy? Plus, they're koalas rather than the standard bear! Fruit gum, ingredients: glucose syrup, sugar, water, gelling agents (carrageenan, gellan gums), acidulant (citric acid), acidity regulator (trisodium citrate), natural flavourings, colours (turmeric, paprika extract, anthocyanins), vegetable extracts (stinging nettle, spinach, curcuma), coconut oil, glazing agent (camauba wax). 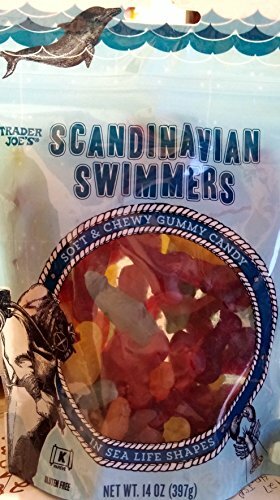 These Scandinavian Swimmers aren't quite gummy "bears." Instead, they come in whimsical sea life shapes including a lobster, a seahorse, a fish, and a dolphin. The flavors are a little unique, too. In addition to more classic berry and orange, this option boasts a mango-peach and huckleberry variety. Trader Joe's began in 1958 as Pronto Markets and was renamed Trader Joe's in 1967. It has been a beloved staple for high-quality, affordable groceries ever since. They have their own store-brand versions of many grocery favorites including frozen foods, juices, boxed baking mixes, soups, and canned goods. Candy is one of the places where the store shines, and these sea animal-shaped gummies are among their beloved sweets. These are another option that steer clear of "bears" and instead go for something a little off the beaten path. In this case, that means Vikings! Each of these gummies is shaped like a viking head complete with bushy beard and horned helmet. There is also a delicious blend of flavors in every bite with strawberry, pear, cherry, black currant, lemon, and orange represented. Of course, just like the Vikings, these candies pack a bit of a punch as they're all dusted with a sour coating to tickle the tastebuds. Candy People is a Scandinavian company that provides bulk candy options. They were founded in 1980 but have only recently started expanding into North America. They offer a wide variety of candies, and in their stores, you can "pick and mix" by dumping searching bulk bins and creating your own special blend. 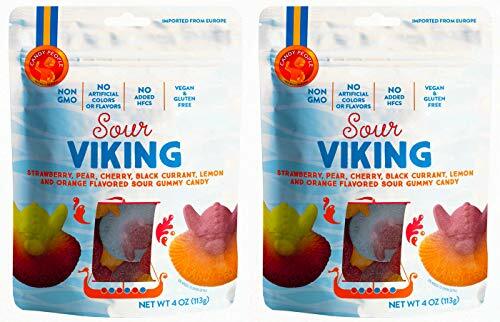 They also provide individually-packaged versions of their treats, including their Sour Viking gummies. These brightly-colored treats are shaped like the berries they represent for a classic, simple combination of red berry flavors. 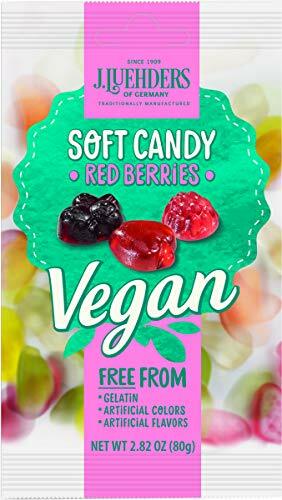 This long-standing German candy company (established in 1909) offers a wide array of candies and several vegan gummy options, including these delicious red berries. 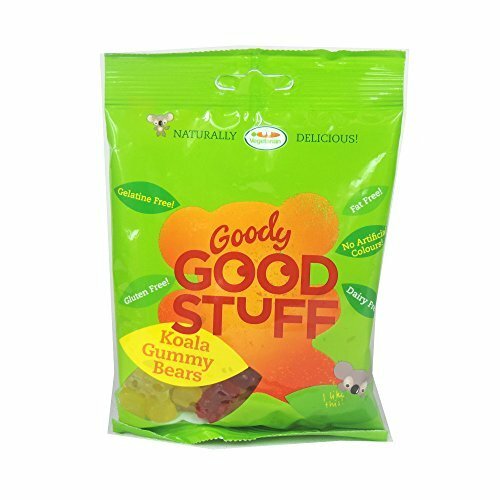 We couldn't find the ingredient statement of these, but several sites have confirmed that these gummies are indeed vegan. Plus, the package says free of gelatin and artificial colors/flavors. Wine lovers, rejoice! What's more exciting than a gummy bear that's flavored like rosé and Prosecco? These gummy bears are perfect an adult who's still a kid at heart. They've even got a slight fizz to them! Squish is a candy company that was founded in Montreal. They make all sorts of artisan gummies, candy colas and more. Not all their candy is vegan, but they have a dedicated vegan section of their website. The name says it all on this one. Are you looking for strawberry flavor? Do you want it in the shape of an alligator? Check and check. This Florida-based and family-owned foods business offers a variety of natural and organic options including cereals, protein bars, and cooking oils. 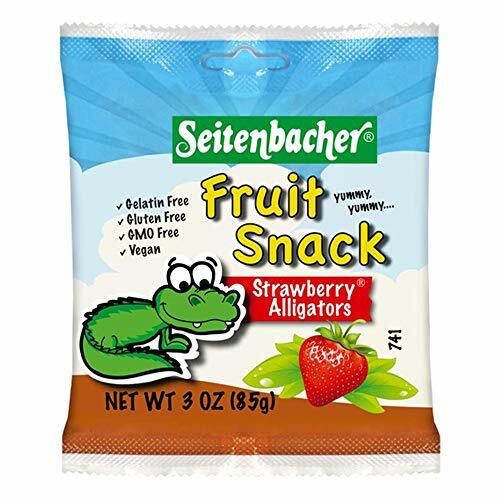 Their Strawberry Alligators are a fun vegan gummy snack option. Apple Juice Thickened, Apple Pectin, Strawberry Juice Thickened, Lemon Juice Thickened, Natural Flavors, Carnauba Wax, Beetroot Juice Thickened. These gelatin-free dummies are offered in a variety of flavors including fruit and cola. This is also a treat that has kept the connection to the classic gummy "bears" and uses the traditional shape of little bears with their arms stretched out as if to offer a hug of flavor. Are Gummy Bears Typically Vegan? If you're out looking at some of the most popular brands of gummy bears, odds are that they aren't vegan. The most common culprit ingredient is gelatin. Although gelatin looks like a harmless white powder, it's actually made out of bones, skins and cartilage from animals. This also means that most gummies can contain pork -- something that you should be aware of if you're avoiding them for religious (such as Kosher and Halal) rather than ethical purposes. Gelatin is also the main ingredient in non-vegan jello. The other culprit ingredient is beeswax such as that found in the ever-so-popular Haribo gummies. It is commonly used so that the bears don't stick together in the package. Are Gummy Bears Usually Gluten-Free? Most gummy bears on the market that I've seen have certainly been gluten-free. In fact, you'll see several brands on this list which advertise it right on the packaging such as Seitanbacher and Goody Good Stuff. But even if it's not advertised, you'll find that ingredient statements for gummy bears are unlikely to contain any ingredients with gluten. The main thing you should check for is cross-contamination statements if you have a serious gluten-allergy. Did you know that you don't necessarily have to buy a bag of candy to enjoy the gummy treat and burst of fruit flavors. It's relatively easy to make your own vegan gummy bears at home, and you'll get the added benefit of being able to try your own flavor combinations for a treat that's uniquely yours.